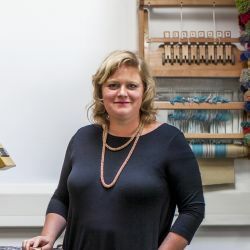 Margo Selby Studio is focused on pushing the boundaries of weaving to create beautifully crafted, contemporary fabrics for a range of textile applications. Handweaving is at the heart of everything we do, from Margo's individual artworks through to our commercially woven fabrics. Our designs are recognisable for their complex structure, striking colour and geometric pattern.